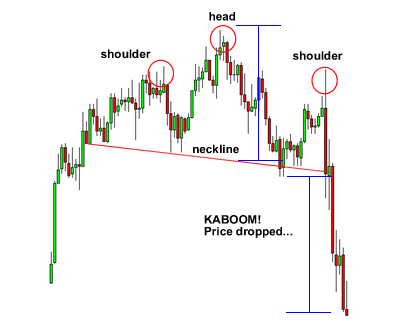 The head and shoulders pattern is widely known as a strong indication of impending price action reversal. By its very nature, it always appears at the top of an uptrend, although it's alter ego, the inverse head and shoulders, makes its appearance at the bottom of a downtrend. Consequently, it is often called a "bearish reversal pattern". The important feature of this pattern is, that you should never recognize it as such until retreating price action confirms, or validates, the right shoulder. 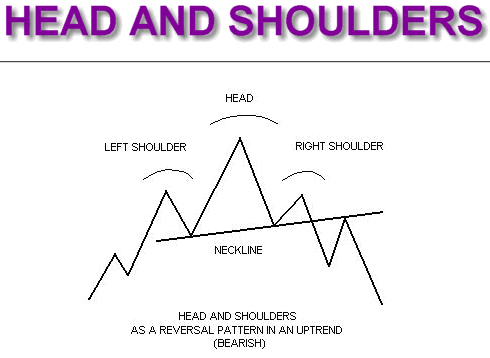 The head and shoulders pattern has 4 components to it. As an uptrend begins to weaken, the forces of supply and demand begin to create indecision. The Bulls and Bears begin to wrestle for control of future price direction. The price makes an initial thrust high but the sellers come in and force it back down. This completes the initial and left shoulder - and also starts the neckline. But the buyers, seeing an opportunity, soon return and push the price to a new high. This will eventually be called the "head" - but only once the pattern is complete. At this stage of the game, it may simply look like a "higher high" and for all intents and purposes, like the trend is continuing. However, in this instance, the new high is quickly wiped out by the Bears and a new "low" (or trough) is formed. This new "low" at the base of the "head" may be higher than, or equal to, the previous low. The second of these will provide the most reliable indicator that the trend is reversing. But the buyers now come in for a third round and the market rallies higher once again - but fails to take out the previous high ("the head"). This last top reveals the right shoulder. This buying energy soon evaporates and so the market tests the downside yet again. The base of this move forms the final part of the "neckline" and at this point, what happens next is critical. To validate the head and shoulders pattern, you should at this point, have drawn a trend line across the three troughs - from the left shoulder, the head and finally the right shoulder. If the price action continues downward and closes below the neckline, you have your head and shoulders pattern confirmed. 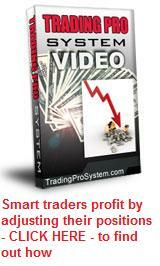 Volume has a greater importance in the head and shoulders pattern in comparison to other patterns. Volume generally follows the price higher on the left shoulder. However, the head is formed on lower volume indicating the buyers aren't as aggressive as they once were. On the last rallying attempt, the left shoulder volume is even lighter than on the head, signaling that the buyers may have exhausted themselves. New selling comes in and previous buyers get out. 1. Draw a vertical line from the top of the head to the neckline. right shoulder has been breached at the neckline. 3. The low point of this second vertical line is your new low price target. From the above image, You can see that once the price goes below the neckline it makes a move that is at least the size of the distance between the head and the neckline. Using the head and shoulder chart pattern in conjunction with other indicators such as the Relative Strength Index or the MACD, can prove a very powerful combination.